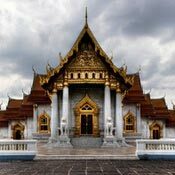 Wat Benjamabophit or the Marble Temple is named for the gleaming white Italian marble used in its construction. 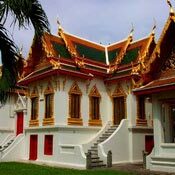 The most modern and one of the most beautiful of Bangkok's royal temples, it is also notable for its European influences like its stained-glass windows combined with Thai architecture. 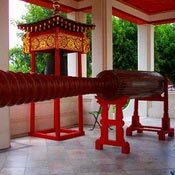 Wat Benjamabophit was built in 1899 by Prince Narai, half-brother of Rama V. Thailand's current king spent his days as a monk here before his coronation. 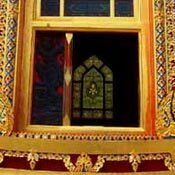 Today, it is not only a magnificent Thai temple, but a seat of learning for Buddhist monks with intellectual interests. True to its name, the Marble Temple gleams with the polished white stone from Carrara's quarries, including the pavement of the courtyards. 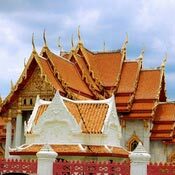 Unlike the older temple complexes in Bangkok, the Marble Temple has no central wihaan or chedi. Instead, it has many smaller buildings. 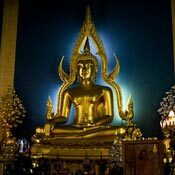 The main bot or chapel contains a golden Buddha statue against an illuminated blue backdrop. 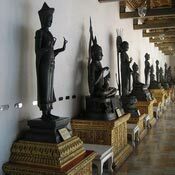 Beyond the main bot is a cloister containing over 50 bronze Buddha images in many different styles, representing various Buddhist countries and regions. Unlike most other temples, monks do not go out seeking alms but are instead visited by merit-makers from 6-7am. During the early mornings, monks chant beautifully and intensely in the main chapel.